Overseas Workers, Welfare Administration (OWWA) is urging every Overseas Filipino Workers to register and become active members of the agency to get benefits, not only for themselves but also for their dependents or families. According to OWWA Region-10 Director Roselle Bartolome, an active member of OWWA can enjoy benefits such as livelihood projects, scholarship for their children and many others. Registered and an active member also becomes the priority of the government. While those who are inactive, they do not get anything from the government. B. Death Benefit. The family of an active OFW at the time of his death is entitled to receive P100, 000.00 if the cause of death is natural, and P200, 000.00 if the cause of death is an accident. On top of the death benefit, a rider of P20, 000.00 will be received by the beneficiaries for the funeral expenses. Qualified are beneficiaries of active OWWA member. a. Country Specific Pre-Departure Orientation Seminar (PDOS) – The one-day PDOS is a compulsory orientation to OFWs in adapting or adjusting to the work environment as well as to the culture of their country of destinations. Its primary objective is to provide OFWs with the means to cope with their new work environment especially during their first few months of working abroad. The 1-day PDOS is attended by all workers (all skills) prior to their deployment abroad. b. Comprehensive Pre-Departure Education Program (CPDEP) - The CPDED is either a four or six-day orientation seminar attended by Household Service Workers (HSWs). The CPDEP is jointly conducted by accredited NGO PDOS providers and OWWA. The NGO-accredited PDOS providers administer the PDOS on the first day, while OWWA handles the language, culture and stress management sessions on the succeeding days. The program intends to provide job-related training in upgrading the knowledge, skills and develop expertise among Filipino seafarers in accordance with technological advancements and global maritime standards. It is in the form of financial assistance with OWWA assuming the training cost as prescribed in the existing implementing guidelines. The applicant may choose his/her preferred training course accredited by Maritime Industry Authority (MARINA) or Technical Education and Skills Development Authority (TESDA) from the list of OWWA recognized Training Providers where he/she intends to enroll. Training assistance is P7,500.00. For subsequent availments, applications may be filed within 90 days from the date of the last arrival to the Philippines/on vacation or following the expiration of his employment contract. The EDSP is a scholarship grant offered to qualified beneficiaries/dependents of active OWWA members who intend to enroll a 4-5 year baccalaureate course in any preferred colleges/universities. It shall be in the form of financial assistance amounting to a maximum of P60,000.00 per school year. The member-OFW must have an active membership with OWWA at the time of the application. The OFWDSP is an educational assistance to qualified dependents of active OWWA-member-OFWs who intend to pursue any 4 or 5-year baccalaureate degree or associate degree in-state college or university. The scholarship shall be in the form of financial assistance of P20,000.00 per year. Scholarship program to a dependent of OFW whose income is not more than US$400.00. Every year, a total of 1,250 scholarship slots are allocated. The CMWSP is a scholarship program extended to deserving migrant workers and/or their immediate descendants who intend to pursue 4 or 5-year courses in the priority fields of Science and Technology. It was created by virtue of Republic Act 8042, otherwise known as the Migrant Workers and Overseas Filipinos Act of 1995. under section 37, Article lX. Educational assistance is P60,000.00/year funds from the PCSO. The examination is administered by DOST. 100 passers qualify to the program. EDSP and CMWSP have the same date of examinations. d. Educational Livelihood Assistance Program (ELAP) - Scholarship for the dependents of OFWs who were active OWWA members at the time of death. Only one child, usually the eldest child of member-OFW is given scholarship grant. It is in the form of training assistance with OWWA assuming the training cost in vocational/technical courses accredited by TESDA and other government institutions as prescribed in the existing implementing guidelines. Financial assistance is P14,500.00. The applicant may choose his/her preferred training course from the list of OWWA recognized Training Providers where he/she intends to enroll. Eligible to avail are member-OFWs and beneficiaries. The program provides services including negotiations with employers, agents, and host country authorities to facilitate the immediate repatriation of OFWs who are distressed or physically/mentally ill, and of human remains. They are accorded airport assistance, temporary shelter at the OWWA Halfway Home, psycho-social counseling, stress debriefing, and provision of transport services or fares for their onward travel to their respective provinces. Emergency repatriation is carried out in the event of political unrest or natural calamities. Reintegration is a way of mainstreaming returning OFWs into Philippine society. Reintegration (in-country). Offers livelihood opportunities to OFWs who have finished contracts and have no wish to go back to work abroad. On the other hand, reintegration program is also offered to distressed OFWs by way of self-employment or livelihood project as a means of income-generation for the family even after their overseas employment. This is a non-cash livelihood support/assistance intended to provide immediate relief to returning member-OFWs, active or non-active who are displaced from their jobs due to war/political conflicts in host countries or policy reforms controls and changes by the host government or are victims of illegal recruitment and/or human trafficking or other distressful situations. The program is a package of livelihood assistance amounting to TEN THOUSAND PESOS (P10,000.00) maximum consisting of a. techno-skills and/or entrepreneurial training and b) starter kits/goods and/or c) such other services that will enable the target beneficiaries to quick start a livelihood undertaking through self/wage employment. Eligible beneficiaries- OWWA members, active or non-active. OWWA members with finished employment contracts are not entitled to this Program. The program can be availed only once by eligible beneficiaries and within one year after return to the country. OFW-EDLP, formerly known as OFW-Reintegration Program (ORP), is an enterprise development intervention and a loan facility of OWWA, in partnership with Land Bank of the Philippines (LBP) and the Development Bank of the Philippines (DBP) intended to support enterprise development among OFWs and their families. Term Loan: based on cash flow but not to exceed 7 years, inclusive of maximum of 2 years grace period. 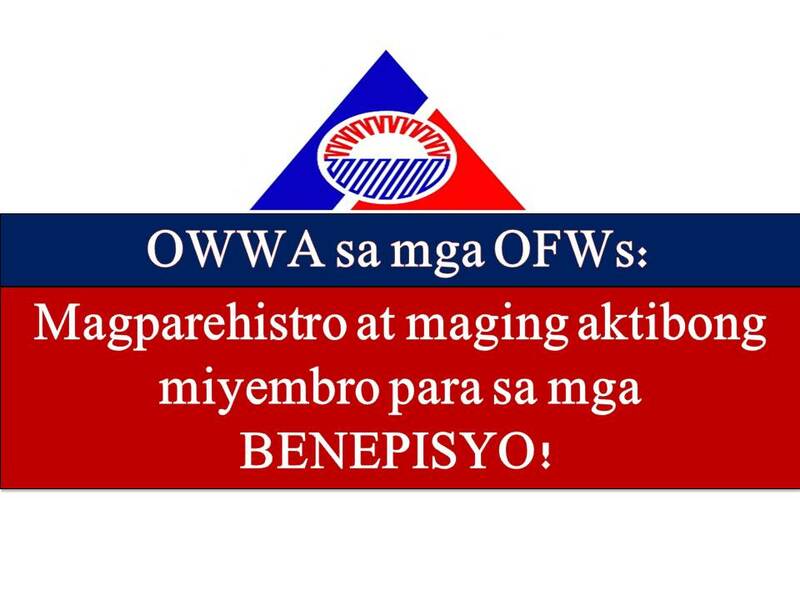 WHAT ARE YOUR OWWA Benefits And How To Avail Them?